I used to pride myself on perfection. (In my head at least.) I liked to think of myself as a perfectionist. My mum would disagree. She actually was a perfectionist, and could sew and knit to professional standard while my knitting looked liked a ball of wool after the kitten has played with it, and the cushions I sewed are currently spewing threads and filling all over my sofa. So perfectionism and the desire to always set myself very high standards has driven me most of my life – to very good effect. But in Donegal, sitting by the sea one day I had a sea change. It’s something about that sky that makes me realise how far my limits can go. Something about that solitude that makes me hear my own voice. Something about that beauty that makes me see a better view of my life. 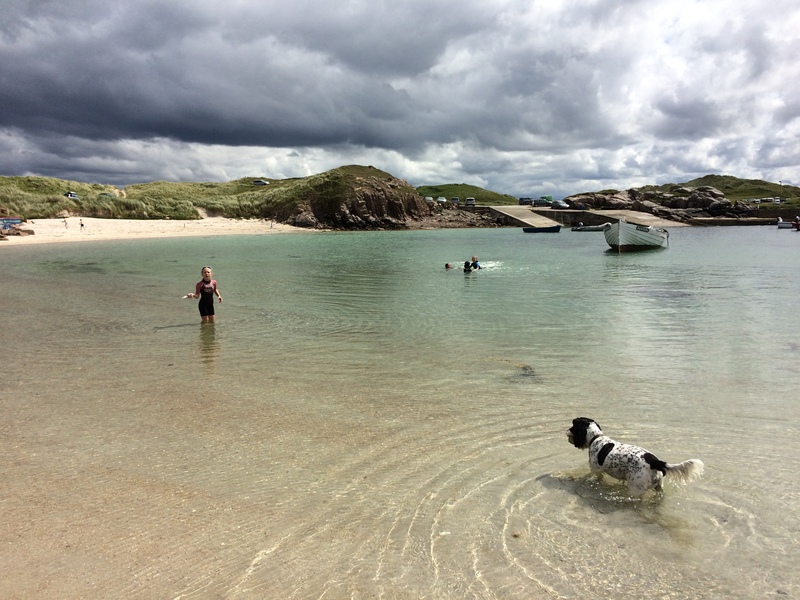 I sat on the beach, my girls swimming and kayaking in the water, having the real Swallows and Amazons holiday they need every year where everything is just stripped away until only they and themselves and nature are left, and I had a revelation. I have been sick with one or other awful thing for the last seven months (abscesses, chest infections and migraines to name but a few) , I have been stressed, I have been agitated and whiney with the girls at times, I have been angry, I have been hurt, I have been overwhelmed, I have been soul sad and will weary. And as if that wasn’t all bad enough, I decided to heap a big dollop of guilt like a big red cold sore cherry on top of the melting ice-cream sundae of my life. I have actually been annoyed at myself for all of those things, for not being perfect. I had set myself a standard whereby I would sail through the worst time of my life, all smiles and strength, and I was failing miserably. So I decided to put my Wonder Woman pants in the wash and sit on the beach and accept that for now, my life is n ot perfect, and so I’m not going to kill myself making me perfect either. And like Donegal in the rain, my life is still pretty spectacular though – I have three amazing girls, a heritage of past family that will help me create my new family, the love from my mum and dad spurring me on, amazing friends who remind me that I don’t need to be perfect and love me for me, a book deal, a business doing something I love….. and most of all, like the Donegal sky, a limitless horizon. My life is not perfect. But it doesn’t need to be. And neither do I. Sounds like you hit the sweet spot in divorce proceedings. You are OKAY!